These AmeriHome Metal Bar Stools are durable enough for use in the shop, and stylish enough to use in the kitchen, game room, bar, basement, dorm room, or loft. Ideal for small spaces, the bar stools easily and neatly stack together, making them easy to stash out of the way for storage. A handle in the seat makes the stools easy to pick up and move. Lightweight and sturdy, each stool weighs only 12.5 lbs., but is strong enough to hold up to 330 lbs. 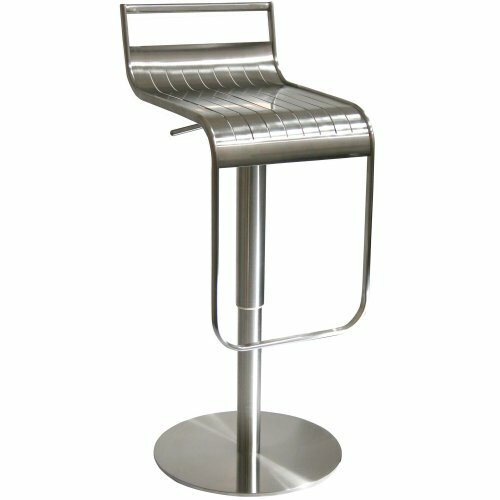 Each Metal Bar Stools has a brace under the seat that provides additional support and stability. No-mar rubber feet keep them from sliding and scratching hardwood floors. 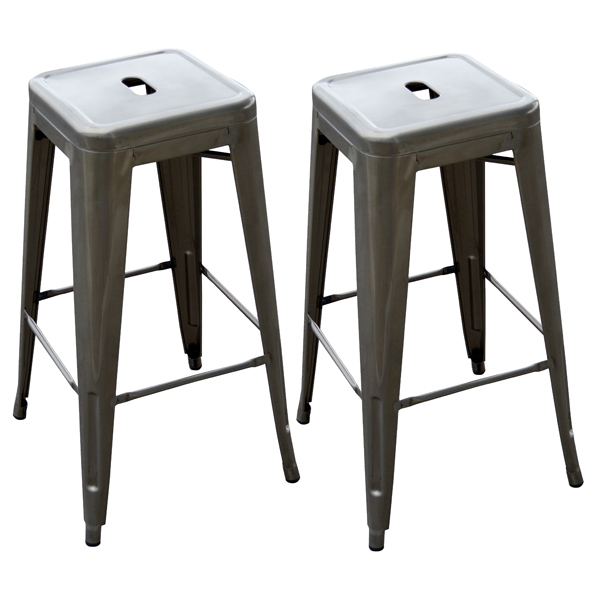 They bar stools are painted deep gunmetal silver with a scratch-resistant powder coat paint finish. Each Bar Stool stands 30 inches tall with a seat measuring 12 in L x 12 in W. Sold in a set of 2. 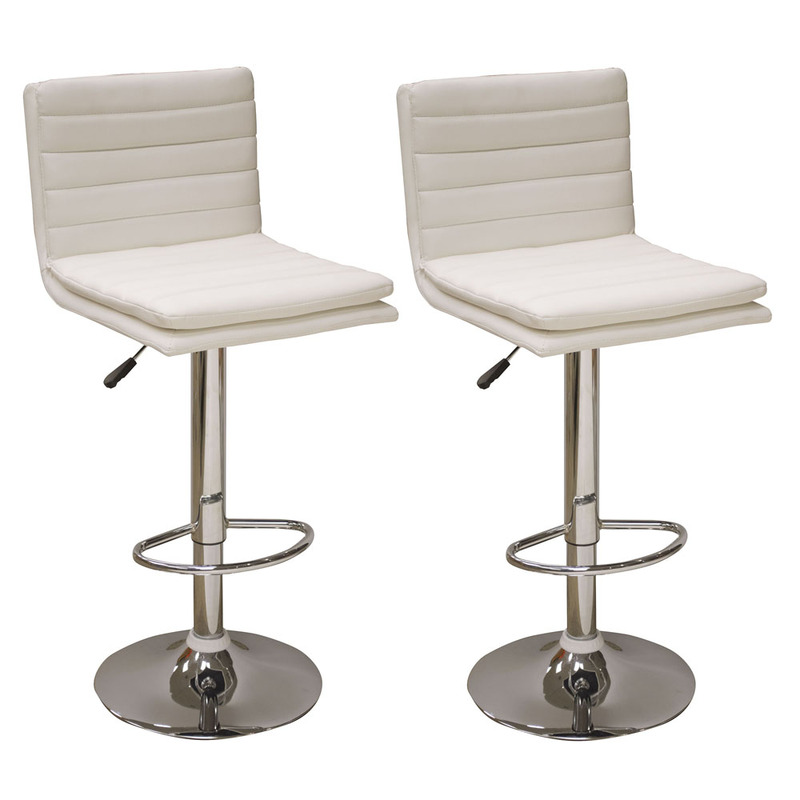 Add a bit of sophistication to your kitchen, bar, game room, basement, or shop with the AmeriHome 2 Piece Bar Stool Set in glossy white. Sleek silhouettes with polished mirror-like chrome bases and shiny white molded seats give this set a clean, modern, loft-like style. These bar stools are designed with comfort in mind. With large 14.75 inch wide molded ABS plastic 360 degree seats, built in footrests and an adjustable height of 22.5 to 31 inches. Great features that make these bar stools comfortable for everyone. Adjustable height from 22.5 to 31 in. Maximum seat back height 36 in. The AmeriHome Adjustable Height Bar Stool with Round Back adds a classic element to the kitchen, bar, game room, basement, or shop. The black vinyl seat and mirror-like polished chrome base and footrest let this bar stools blend seamlessly with almost any decor. 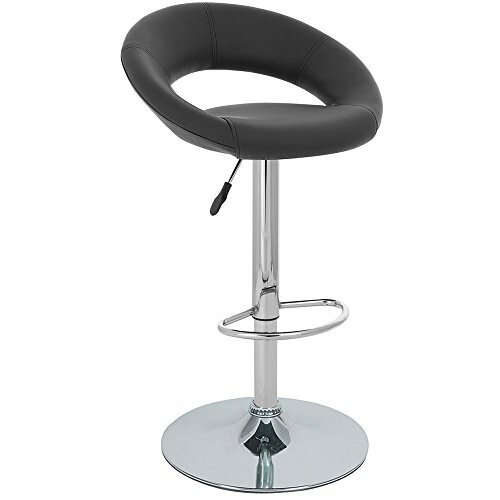 This bar stool was designed with comfort in mind and featuring a 21.5 inch wide buy 19.5 inch deep, padded vinyl 360 degree swivel seat, a rounded and padded vinyl back rest, a built in footrest, and an adjustable seat height of 24 to 32 inches. All features than make these stools comfortable for kids and adults. Adjustable seat height from 24 to 32 in. Maximum seat back height of 40 in. 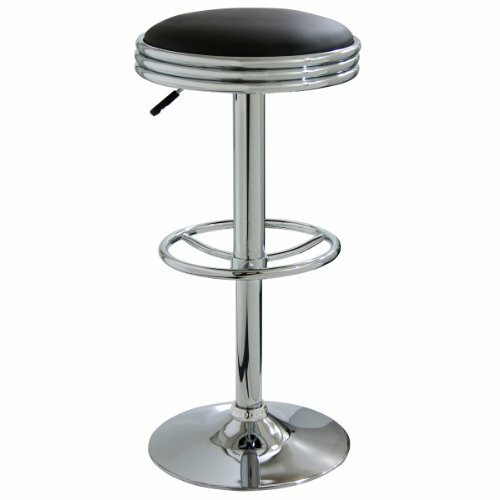 The AmeriHome Soda Fountain Style Bar Stool lends a cool retro vibe to any game room, basement, bar, kitchen, or shop. The bar stool has a design reminiscent of the days of diners and drive-ins, and features a mirror-like polished chrome base and a red vinyl seat for a hint of vintage retro style. 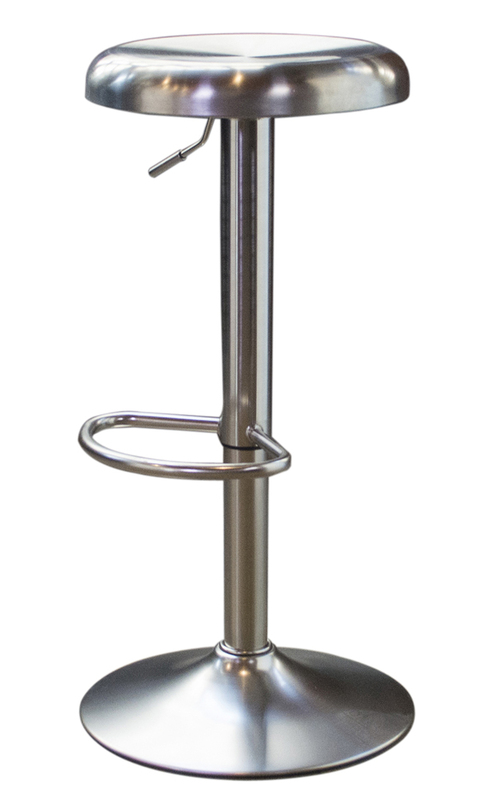 The Soda Fountain Style Bar Stool is designed for maximum comfort. With a large 15.75 inch wide padded vinyl 360 degree swivel seat, a built in footrest and an adjustable seat height of 23.5 to 31.75 inches. This stool is comfortable for kids and adults. Durable enough for use in the shop, and stylish enough to use in the kitchen, each Metal Bar Stool has a brace under the seat that provides additional support and stability. No-mar rubber feet keep them from sliding and scratching hardwood floors. 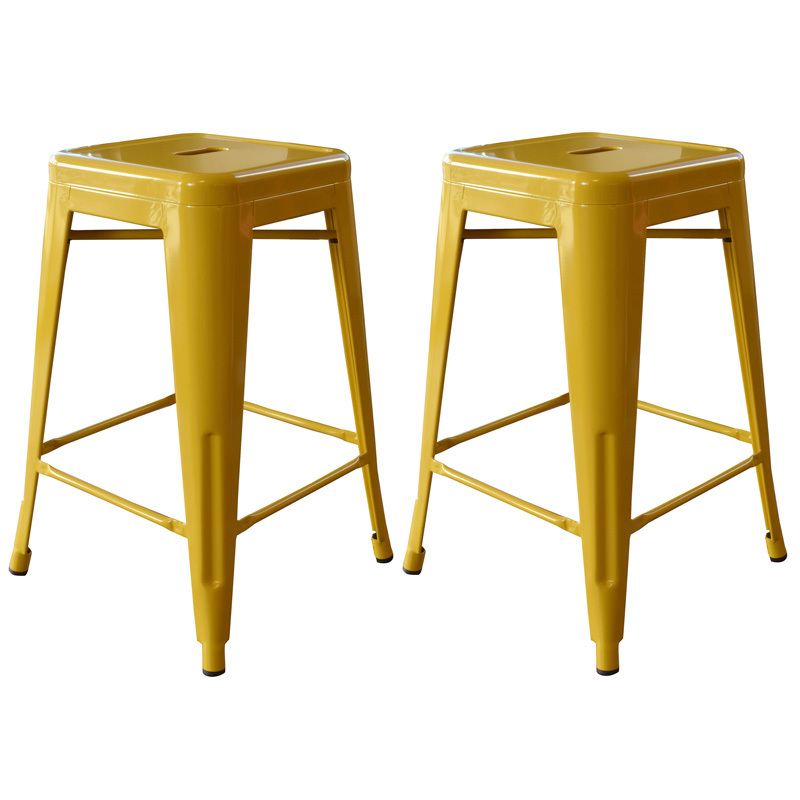 They bar stools are painted with a scratch-resistant powder coat paint finish for rich deep color. Each Bar Stool stands 24 inches tall with a seat measuring 12 in L x 12 in W. Sold in a set of 2. 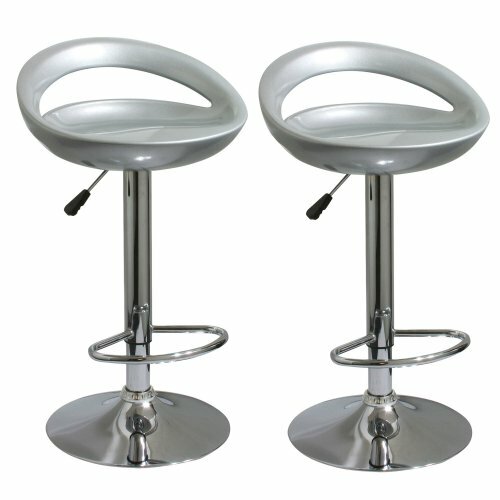 Each Metal Bar Stools has a brace under the seat that provides additional support and stability. No-mar rubber feet keep them from sliding and scratching hardwood floors. 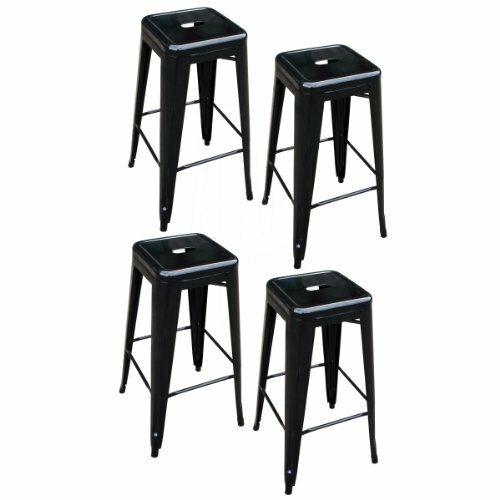 They bar stools are painted a deep black with a scratch-resistant powder coat paint finish. Each Bar Stool stands 30 inches tall with a seat measuring 12 in L x 12 in W. Sold in a set of 4. Add a bit of sophistication to your kitchen, bar, game room, basement, or shop with this AmeriHome Stainless Steel Bar Stool. A sleek silhouette with type 201 brushed stainless steel seats and a heavy duty stainless steel base give this set a clean, modern, loft-like style. These bar stools are designed with comfort in mind. It has a large 15 x 13.75 inch, 360-degree swivel seat, built in footrests and an adjustable height of 22.5 to 30.5 inches. Great features that make this bar stool comfortable for everyone. Adjustable height from 22.5 to 30.5 in. Max. seat back height 36 in. Style or comfort? Why pick when this dark oak finish wood counter height stool blends both so seamlessly? With its plush black swivel seat, interlocking circle design and perfectly positioned circular footrest; this 37.5" high barstool will add a touch of elegance to any game room or dining area. 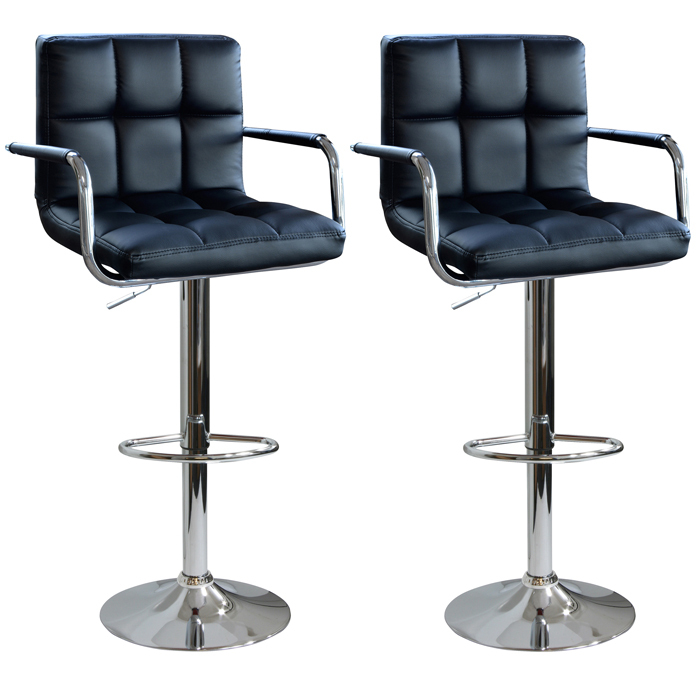 This AmeriHome 2 Piece Adjustable Height Bar Stool Set includes two retro style, adjustable height black vinyl bar stools. 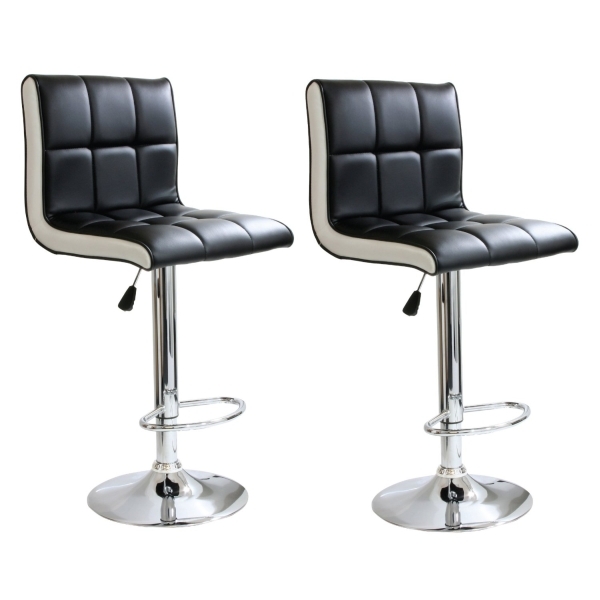 This 2-piece bar stool set is reminiscent of the days of diners and drive-ins, and features a polished chrome base and a black vinyl seat and back rest for a hint of vintage retro style. Designed for maximum comfort, each bar stool features a large 13.5 inch wide, padded, 360 degree swivel seat, a padded vinyl back, a built in footrest and an adjustable seat height of 25 to 33.5 inches, which makes this set comfortable for kids and adults to sit together. Adjustable seat height from 25 to 33.5 in. Max seat back height 42.25 in. The AmeriHome 2 Piece Two Tone Padded Bar Stool Set is perfect for a game room, garage, man cave, or finished basement. 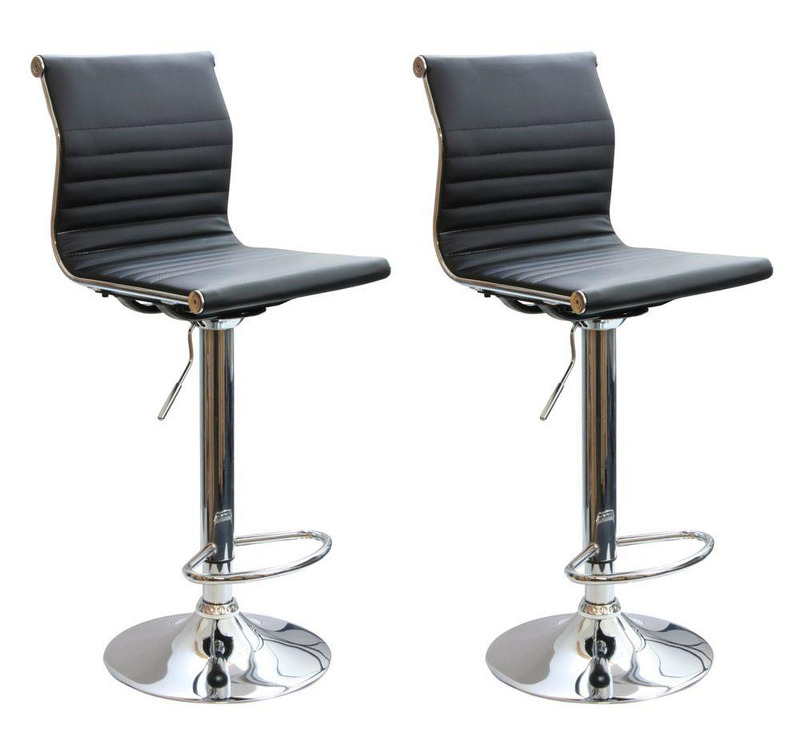 A black seat with white sides and a mirror-like polished chrome base give this Two Tone Bar Stool Set a casual contemporary style. Your guests will have a comfortable place to sit and watch the big game on the 17.5 in wide by 15 inch deep padded black vinyl seats. 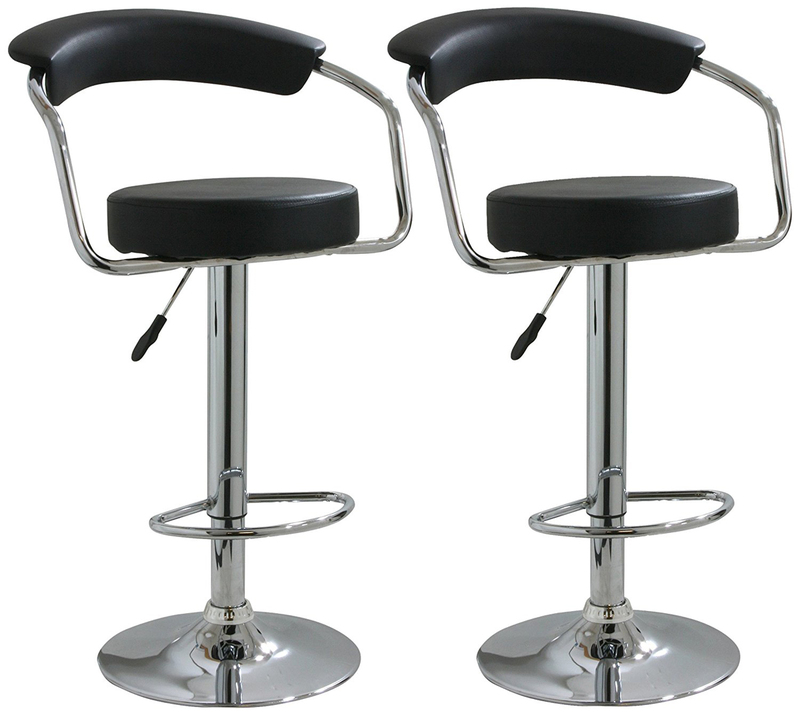 These bar stools also feature an adjustable seat height of 24 to 32 inches, built in footrests, and a weight capacity of 265 lbs. Maximum seat back height of 41 in. 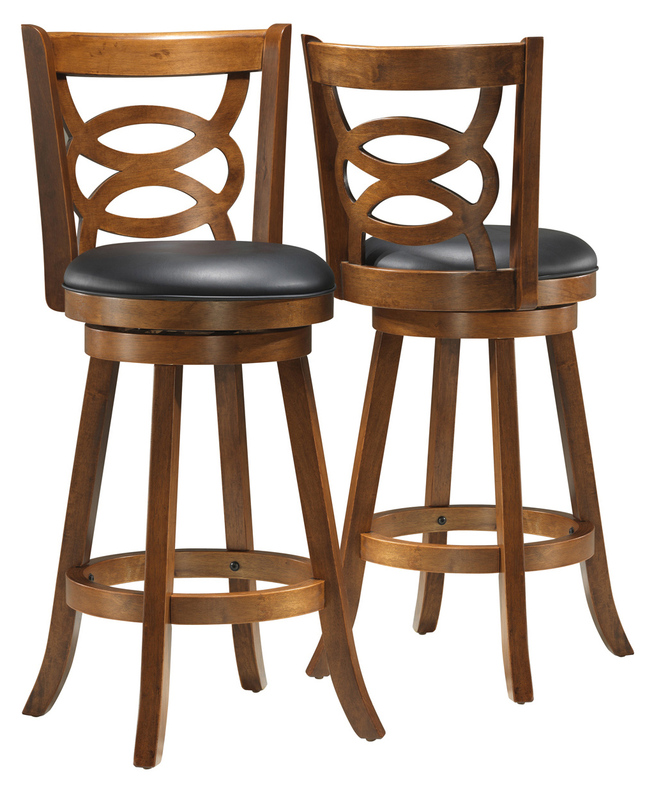 The AmeriHome 2 Piece Bar Stool Set adds a classic element to the kitchen, bar, game room, basement, or shop. The black vinyl seat and mirror-like polished chrome base and footrest let this bar stools blend seamlessly with almost any decor. These bar stools are designed with comfort in mind. With large 21 inch wide, padded vinyl 360 degree swivel seats, padded vinyl back rests, built in footrests, and an adjustable seat height of 24 to 32 inches. These stools are comfortable for kids and adults. Maximum seat back height 40 in. Style or comfort? Why pick when this dark oak finish wood barstool blends both so seamlessly? With its plush black swivel seat, interlocking circle design and perfectly positioned circular footrest; this 42" high barstool will add a touch of elegance to any game room or dining area. 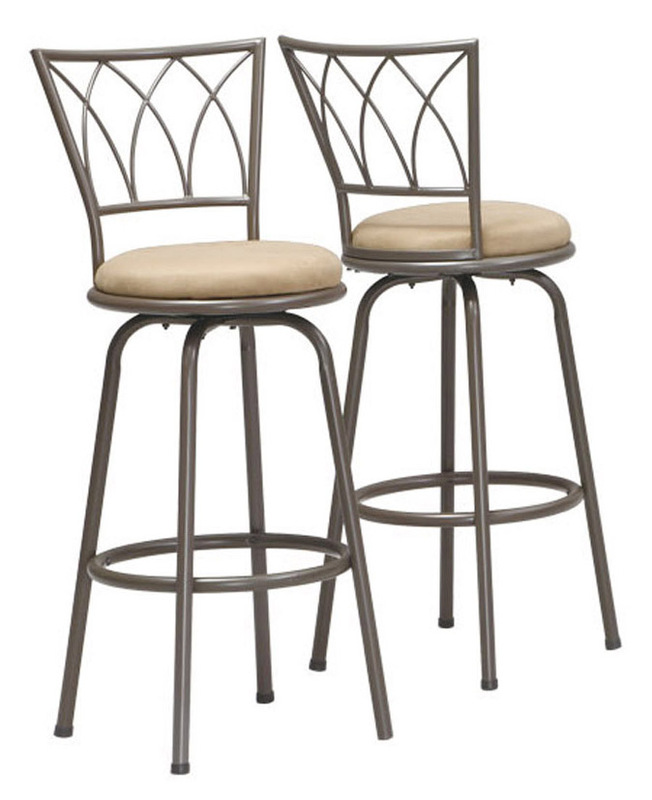 Perfect for your kitchen, breakfast bar or game room, this 2 piece barstool set will be a stylish addition to your home. With a comfortably padded beige fabric seat, brown metal frame, criss-cross back and perfectly positioned foot rest, this stool is as comfortable as it is visually appealing. The full swivel mechanism makes this piece a must have for your casual space! Assembly is required. 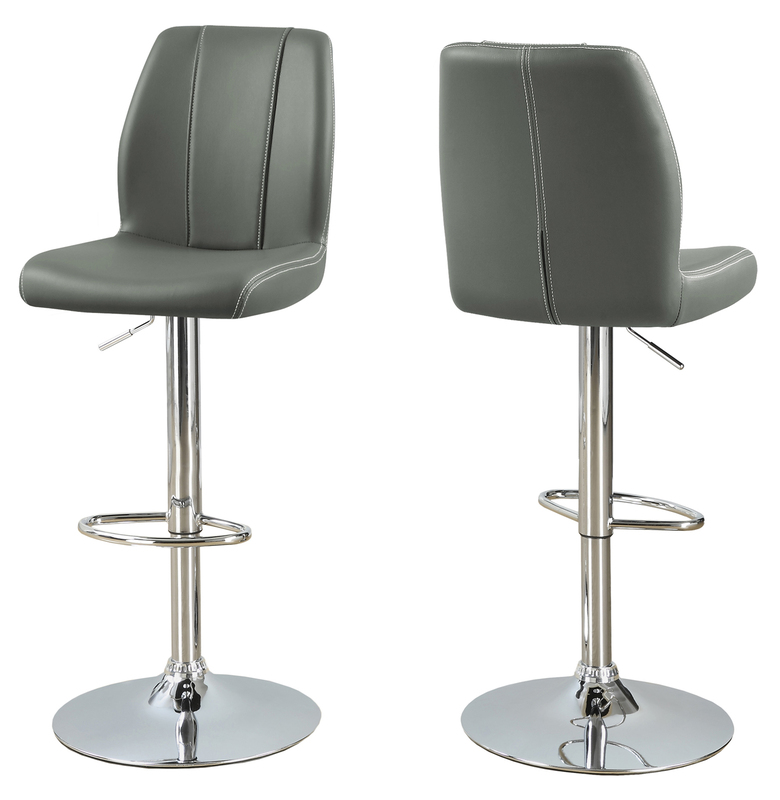 The AmeriHome 2 Piece Adjustable Height Contemporary Bar Stool Set brings a touch of the casual contemporary to complete any room. The padded vinyl seat and back is ideal for kitchen spaces as well as bars, game rooms, and basements. The sleek polished chrome base with built-in foot rest is unobtrusive and allows for comfortable leg room. The padded seat is designed for comfort with a 15 inch wide by 15.5 inch deep seat that swivels 360 degrees and has an adjustable height of 24 to 32 inches. All these features create a great bar stool for all ages. Adjustable Seat Height: 24 in. to 32 in. Maximum seat back height: 44.5 in. 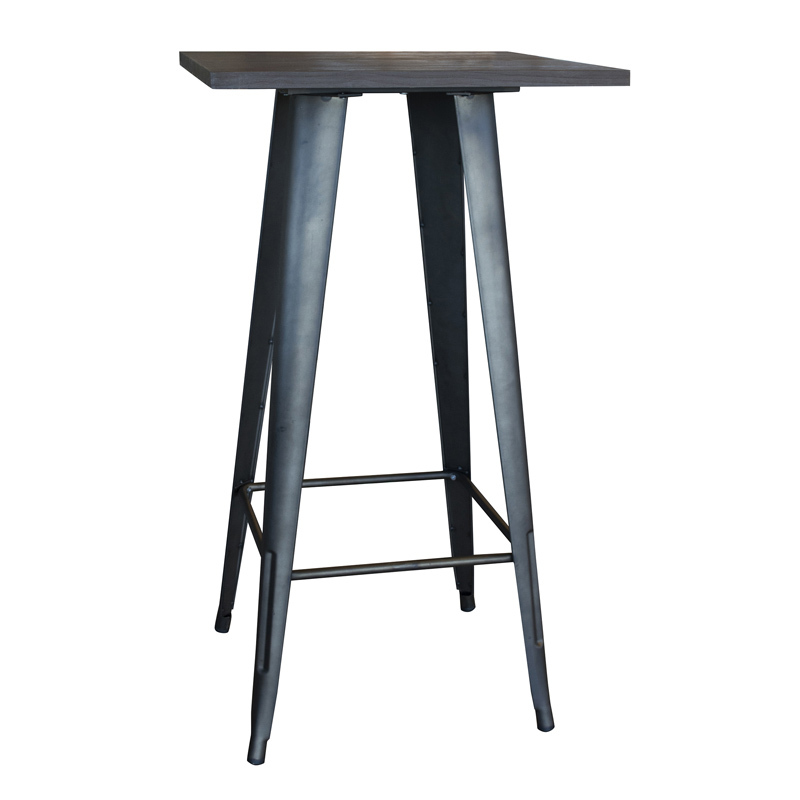 Add some modern industrial charm to you dining room or kitchen with the AmeriHome Loft Rustic Gunmetal Metal Pub Table with Wood Top. The dark elm wood tabletop gives this Pub Table a sophisticated look without being too fussy. Scratch resistant powder coat paint finish is durable and stylish enough to use in the kitchen, game room, bar, basement, dorm room, or loft. Durable and sturdy, the Table weighs 48 lbs., and has a X-brace under the top that provides additional support and stability. No-mark feet keep it from sliding or scratching hardwood floors. The dark elm wood tabletop is 1 inch thick and measures 23.5 x 23.5 inches square, and is 41.5 in. H. The unique and beautiful color if the frame really sets this Wood Top Bar Pub Table apart from others. The Rustic Gunmetal is the color of aged and weathered bronze. A metallic java finish that is polished to a light gloss, and almost shimmers in the light. The smoky espresso color is rich, complex, and beautiful. Each Metal Bar Stools has a brace under the seat that provides additional support and stability. No-mar rubber feet keep them from sliding and scratching hardwood floors. 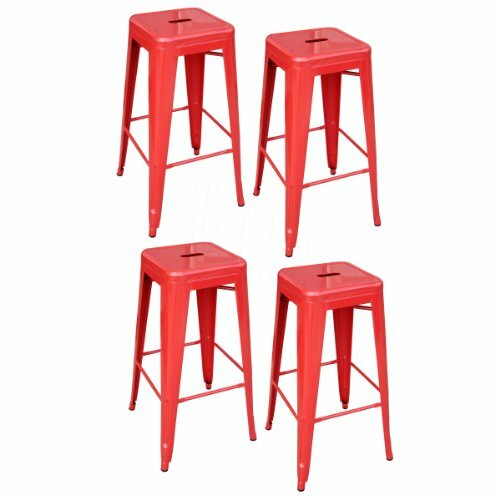 They bar stools are painted a bright red with a scratch-resistant powder coat paint finish. Each Bar Stool stands 30 inches tall with a seat measuring 12 in L x 12 in W. Sold in a set of 4. The AmeriHome Soda Fountain Style Bar Stool lends a cool retro vibe to any game room, basement, bar, kitchen, or shop. The bar stool has a design reminiscent of the days of diners and drive-ins, and features a mirror-like polished chrome base and a black vinyl seat for a hint of vintage retro style. 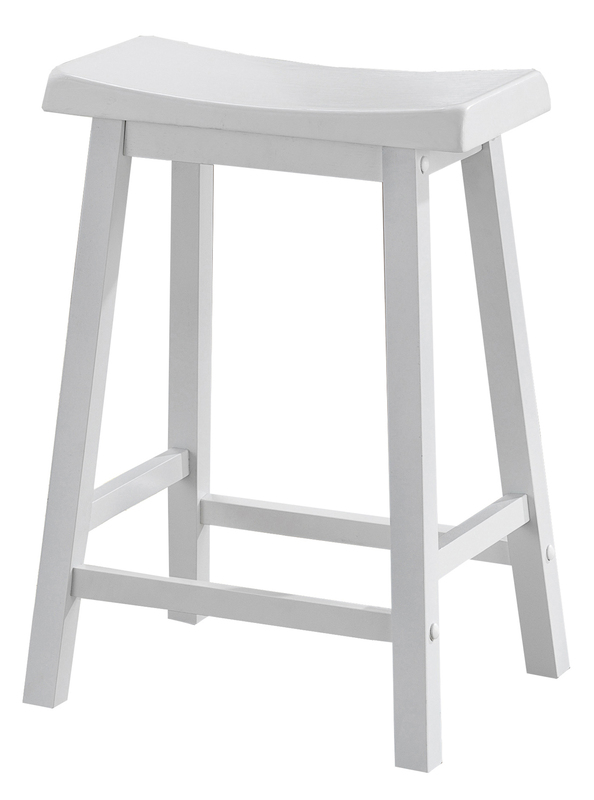 These 24" white barstools are perfect addition for kitchens, game rooms or for extra seating when company arrives. With a comfortable saddle seat and well positioned footrest, these classic stools will be the staple of many memorable evenings with friends and family. Seat Height From Floor (inches): 24"
Add a bit of whimsy to your kitchen, bar, game room, basement, or shop with the AmeriHome 2 Piece Bar Stool Set in glossy silver. 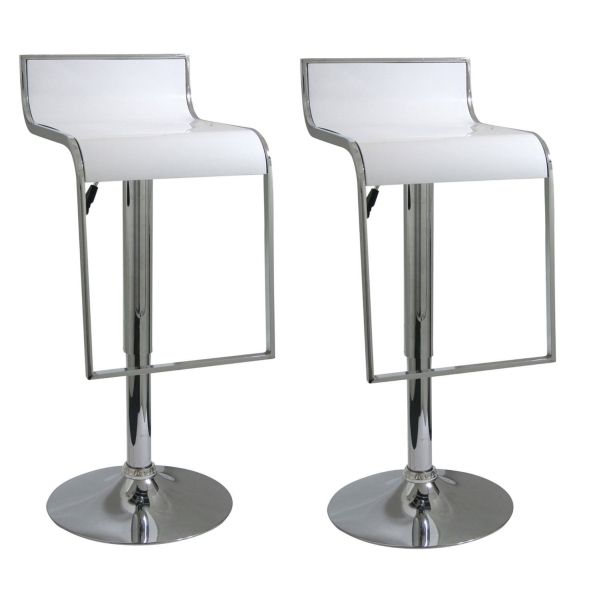 A sleek and fun silhouette with a polished mirror-like chrome base and a pearly silver molded seat give these bar stools an ultramodern look. These bar stools are designed with comfort in mind. With large 18.5 inch diameter molded ABS plastic 360 degree swivel seats, built in footrests and backrests, and an adjustable seat height of 24 to 32.5 inches. Great features that make these bar stools comfortable for everyone. Adjustable seat height from 24 to 32.5 in. Maximum seat back height of 38 in. The AmeriHome 2 Piece Racing Bar Chair Set is perfect for a game room, garage, man cave, or finished basement. 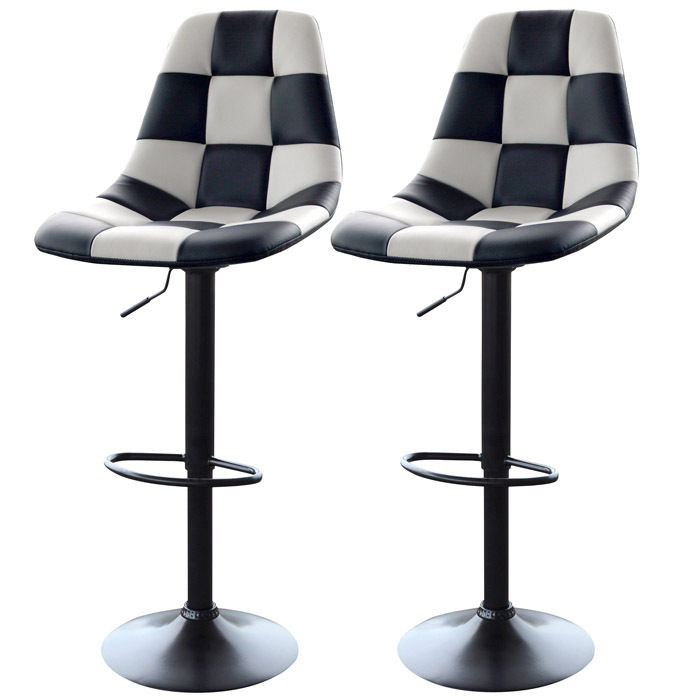 A white and black patterned padded vinyl seat and a matte black base give this Racing Bar Chair Set the look of checkered flag. Your guests will have a comfortable place to sit and watch the big race on the 17.5 inch wide by 18.5 inch deep bucket seats. These bar stools also feature an adjustable seat height of 24 to 33 inches, built in footrests, and a weight capacity of 330 lbs. This sleek and contemporary Mecca collection, dark coffee colored 29" high bar stool is perfect for all types of game rooms and dining rooms. With its high horizontal slat back, comfortable beige pivoting seat and well positioned footrest, this unit is sure to be the staple of many memorable evenings with friends and family. 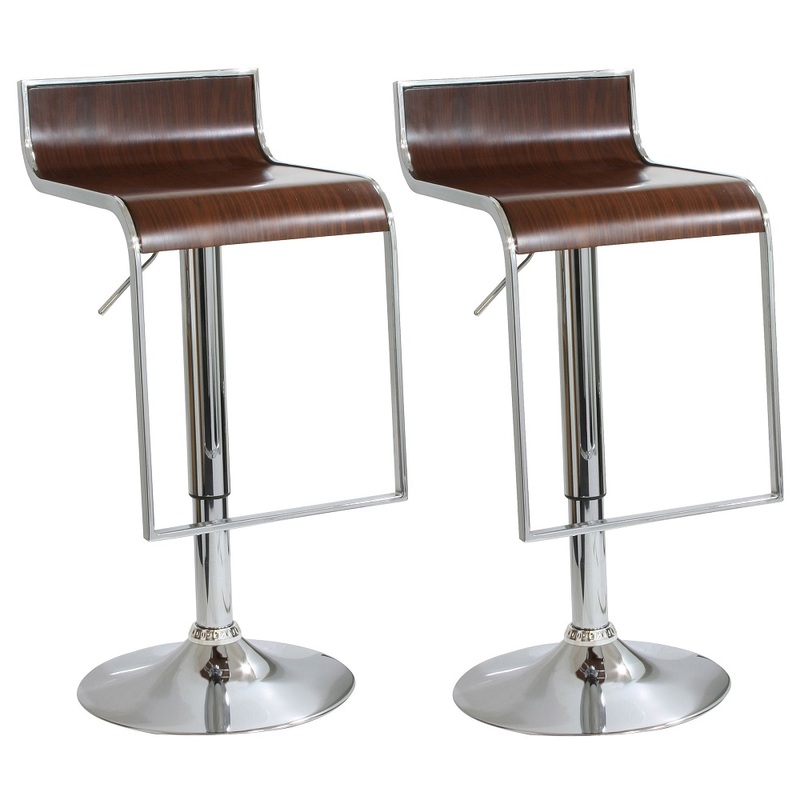 Perfect for your kitchen, breakfast bar or game room, this contemporary bar stool set will be a stylish addition to your home. Generously padded and upholstered in a grey leather look material, this stool is as comfortable as it is visually appealing. The pedestal base with shiny chrome finish features a perfectly positioned footrest for comfort, while the full-swivel mechanism and easy-to-use hydraulic lift system will take you to new heights! 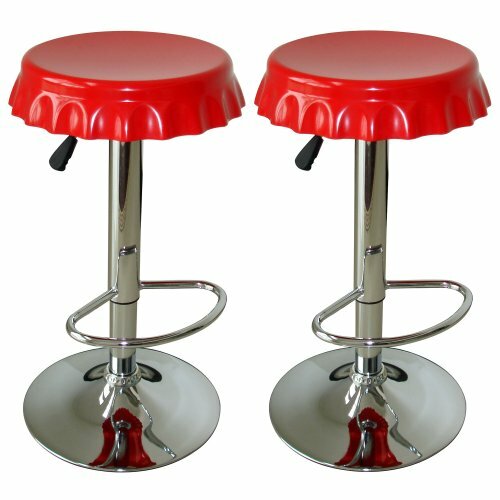 Add a bit of whimsy to your kitchen, bar, game room, basement, or shop with the AmeriHome 2 Piece Soda Cap Bar Stool Set. 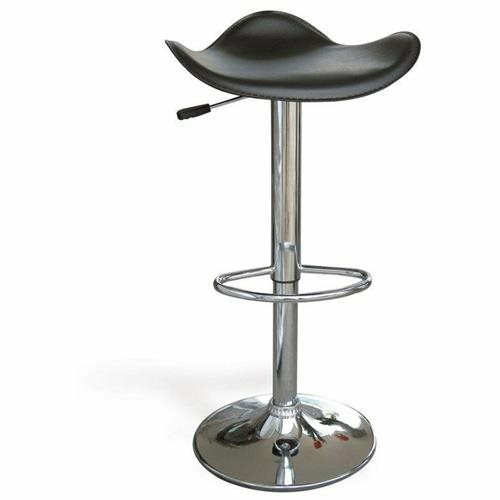 A polished mirror-like chrome base and a soda cap shaped seat gives this stool a fun and funky silhouette. These bar stool are designed with comfort in mind. With a 13 inch, ABS plastic, 360 degree swivel seat, a built in footrest, and an overall adjustable seat height of 23.5 to 32 inches. Great features that make this bar stool comfortable for everyone. Adjustable height from 23.5 to 32 in. 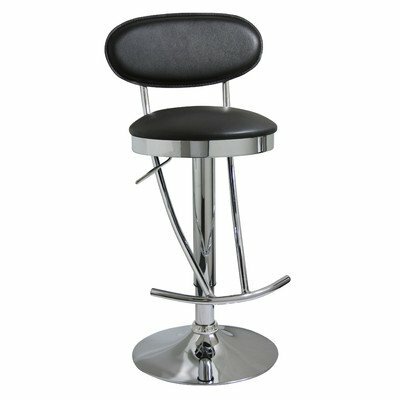 The AmeriHome Adjustable Height Bar Stool adds a classic element to the kitchen, bar, game room, basement, or shop. The bar stool has a style reminiscent of the days of diners and drive-ins, and features a mirror-like polished chrome base and a black vinyl seat for a hint of classic vintage design. This bar stool is designed with comfort in mind. With a large 18 inch wide, padded vinyl 360 degree swivel seat, a built in footrest, and an adjustable seat height of 23.25 to 31.5 inches. This stool is comfortable for kids and adults. Adjustable seat height from 23.25 to 31.5 in. The AmeriHome Modern Ripple Back Two Piece Bar Stool Set has a modern, causal style that would look great at the kitchen island, or the basement bar. With a padded seat and back in a stylish ripple pattern and covered in durable black vinyl, this Bar Stool Set provides comfort with a contemporary look. The generous size of the seat, 17 inches wide by 20.5 inches deep, will provide a comfortable place for your family and your guests savor a cup of coffee in the morning, or a glass of wine in the evening. Thoughtful features like a built in footrest, a 360 degree swivel seat, and an adjustable seat height of 24 to 32 inches, all combine to give this Modern Bar Stool Set set even greater versatility for use in your home or office. Padded seat is designed for comfort with a 17 inch wide by 20.5.5 inch deep seat that swivels 360 degrees and has an adjustable height of 24 to 32 inches. Polished chrome base with built-in foot rest is unobtrusive and allows for comfortable leg room. Give your kitchen counter some style and sophistication with the AmeriHome Loft Stainless Steel Bar Stool. A sleek silhouette gives this bar stool a clean, modern, loft-like style. Constructed with a 13.75 inch round stainless steel 360-degree swivel seat and a solid brush nickel base with built in footrest, this Stool will look just as great in the breakfast nook as it does in the basement bar or game room. The adjustable height, 23.5 to 32.25 inches, and backless design, allows this industrial design Bar Stool to fit almost anywhere, and easily tuck out of the way under countertops. The AmeriHome 2 Piece Padded Bar Stool Set is perfect for a game room, garage, man cave, or finished basement. A thick, foam, black seat and a mirror-like polished chrome base give this Padded Bar Stool Set a casual contemporary style. Your guests will have a comfortable place to sit and watch the big game on the 17 in wide by 20.5 inch deep vinyl seats. These bar stools also feature an adjustable seat height of 24 to 32 inches, built in footrests, and a weight capacity of 330 lbs. Durable enough for use in the shop, and stylish enough to use in the kitchen, each Metal Bar Stool has a brace under the seat that provides additional support and stability. No-mar rubber feet keep them from sliding and scratching hardwood floors. 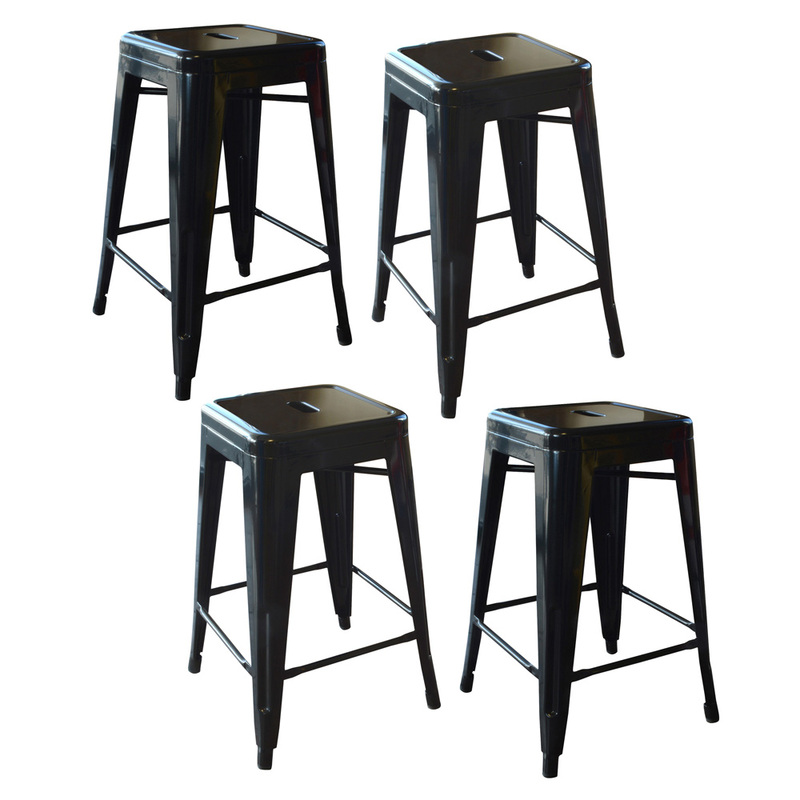 They bar stools are painted with a scratch-resistant powder coat paint finish for rich deep color. Each Bar Stool stands 24 inches tall with a seat measuring 12 in L x 12 in W. Sold in a set of 4. The AmeriHome Adjustable Height Bar Stool lends a cool retro vibe to any game room, basement, bar, kitchen, or shop. The bar stool has a design reminiscent of of the days of diners and drive-ins, and features a mirror-like polished chrome base and a black vinyl seat for a hint of classic vintage style. 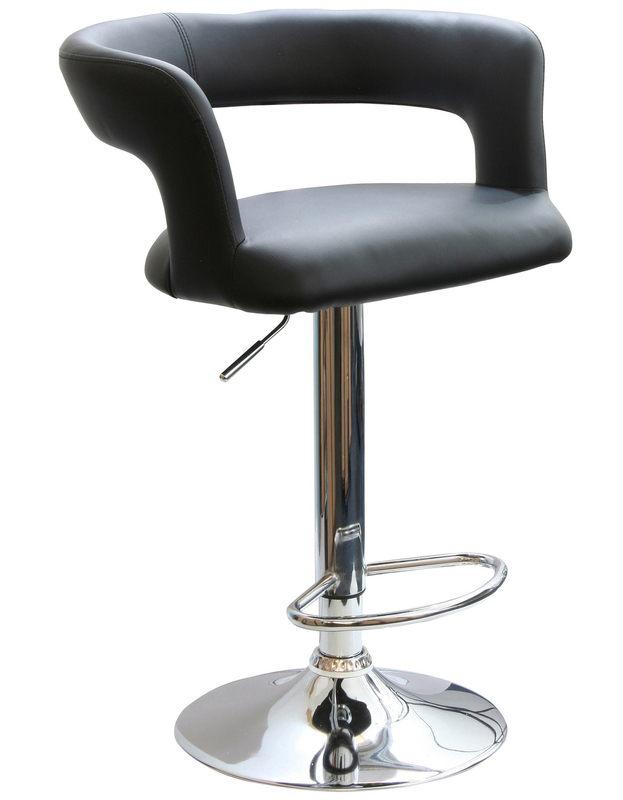 The Adjustable Height Bar Stool is designed for maximum comfort. With a large 15 inch wide, padded vinyl, 360 degree swivel seat, a padded vinyl backrest, a built in footrest and an adjustable seat height of 24 to 32 inches. This stool is comfortable for kids and adults. Maximum seat back height 41in. 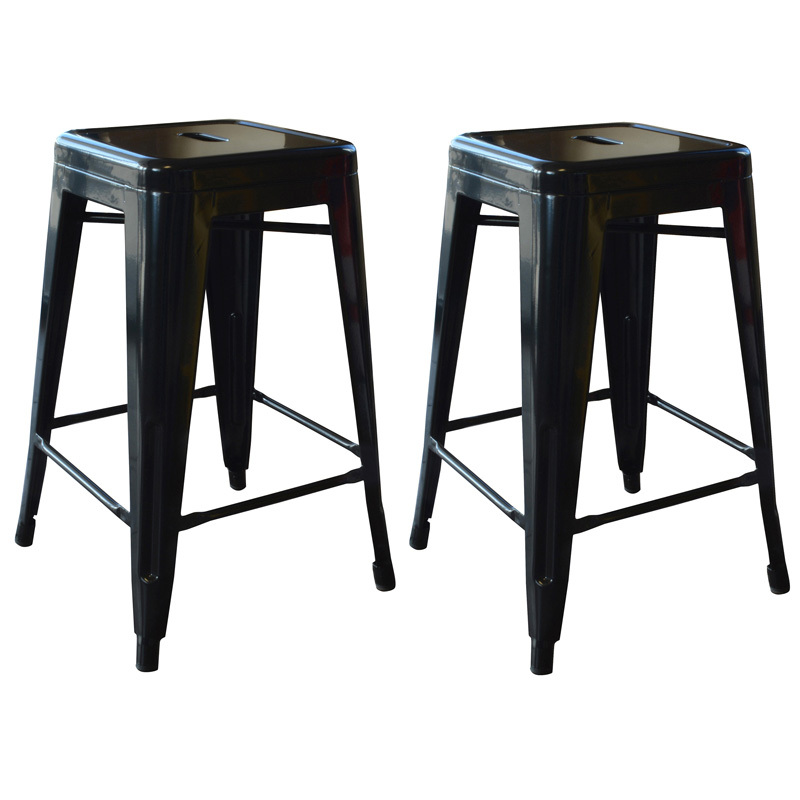 These 24 Inch AmeriHome Metal Bar Stools are great for man caves, dorm rooms, and basement bars. Available in popular team colors, show your support for your Alma mater or hometown team. Ideal for small spaces, the bar stools easily and neatly stack together, making them easy to stash out of the way for storage. A handle in the seat makes the stools easy to pick up and move. Lightweight and sturdy, each stool weighs only 11 lbs., but is strong enough to hold up to 330 lbs. Durable enough for use in the shop, and stylish enough to use in the kitchen, each Metal Bar Stool has a brace under the seat that provides additional support and stability. No-mar rubber feet keep them from sliding and scratching hardwood floors. They bar stools are painted with a scratch-resistant powder coat paint finish for rich deep color. Each Bar Stool stands 24 inches tall with a seat measuring 12 in L x 12 in W. Sold in a set of 4. 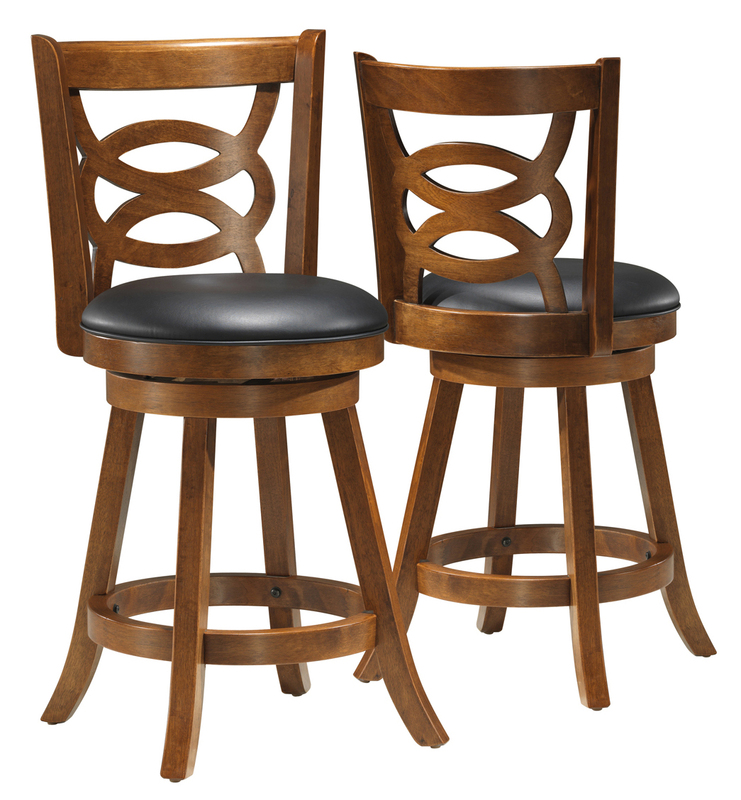 Add a bit of sophistication to your kitchen, bar, game room, basement, or shop with the AmeriHome 2 Piece Bent Wood Bar Stool Set with a dark wood finish. 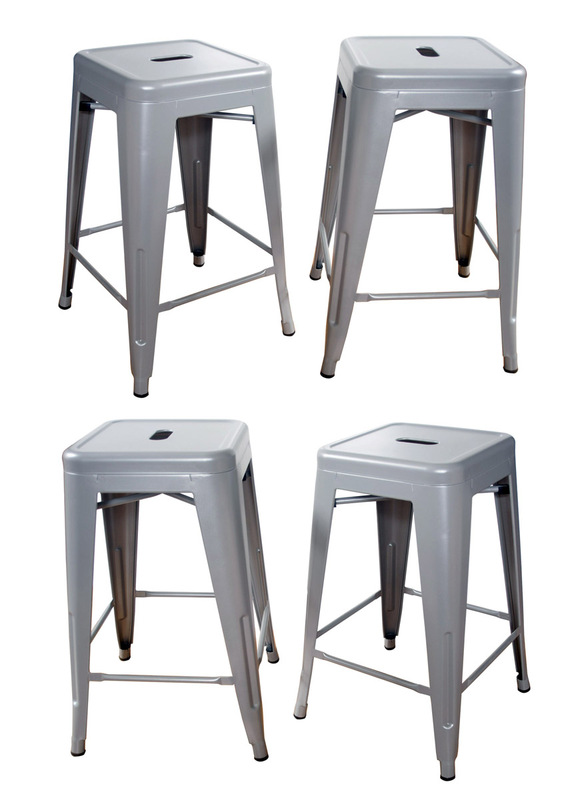 Sleek silhouettes and polished mirror-like chrome bases give this bar stool set a clean, modern, loft-like style. 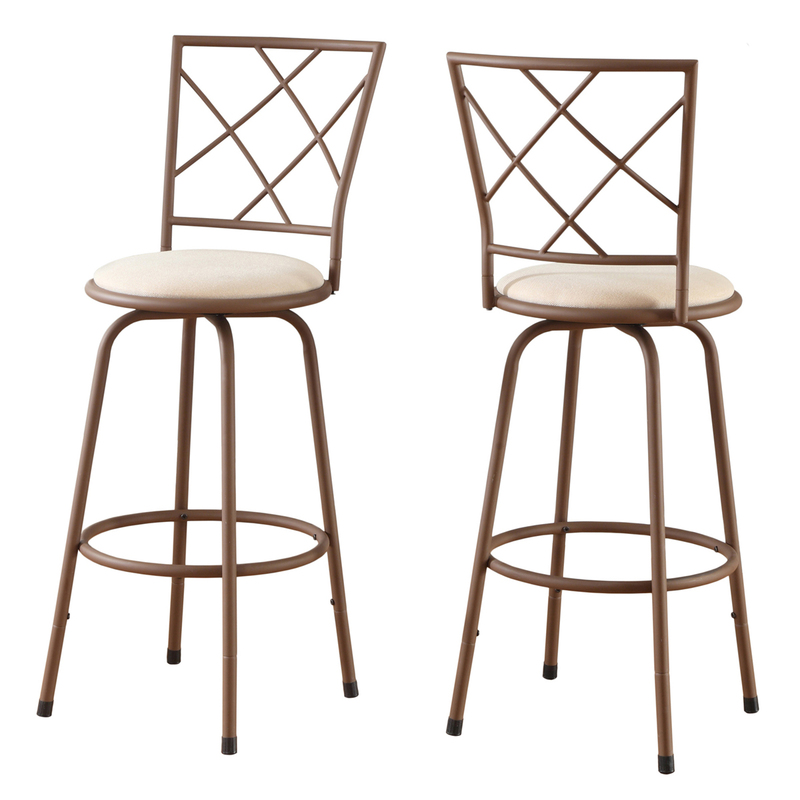 The AmeriHome 2 Piece Adjustable Height Wood Finish Bar Stool Set offers a generous 14.25 inch wide by 16.5 in. deep seat, and built in footrests, making this bar stool comfortable for your family and guests to sit back and enjoy the company. The adjustable seat height of 23 to 31 inches makes these bar stools comfortable for kids and adults. Adjustable Seat Height: 23 in. to 31 in. Maximum seat back height: 36in.